If you’ve recently purchased a new vehicle, you know that in order to drive in most states, you need to purchase a basic type of car insurance, but you may be overwhelmed by your coverage options. Comprehensive and collision are the two types of physical damage coverage available on car insurance policies. Both play an important role in keeping your vehicle in tip-top shape. Minor dents and dings all the way up to full-blown car crunching can be repaired, or the insurance company can at least pay out enough money to make you whole again. Compare the two types of coverage to help determine what you need to protect your vehicle. Regardless of the type of car you drive or where you drive it, by owning and operating a vehicle and driving it on public roads, your car is vulnerable to all types of losses and damages, both to yourself and to others on the road and their property. Though you’re probably most concerned with accidents, your vehicle can also be damaged by acts of weather such as falling tree limbs or monster-sized hail, vandalism or even invaded by creepy crawlers, especially if you park outside or on the street. Think of comprehensive coverage as an all-encompassing insurance option that protects your vehicle against physical damage caused by anything other than a collision — and protects you from having to pay for it. Can be used in combination with any other coverage or even as a stand-alone coverage. Repairs glass damage including windshield chips or cracks. Covers contact with an animal, most commonly deer. Provides protection against storm damage including wind, hail, and flood. Repairs damage from vandals keying your car, breaking into your car, or even theft. Often offers a reasonably priced coverage with a low deductible. Collision coverage is probably the most important coverage you need to have in order to protect your vehicle against physical damage. It is not difficult to accidentally hit something when driving. Somebody is always at fault, and that someone could be you. Some of the most significant damage to your vehicle can come from a collision with another vehicle, tree, pole or guardrail. In order to purchase collision coverage, you’ll need to purchase basic coverage as well. The higher your deductible (the amount you pay if you do get into a collision), the lower your monthly payments will often be — and this can be the best way to get the coverage you need and the savings you deserve at the same time. Collision can only be purchased when combined with liability and comprehensive coverage. 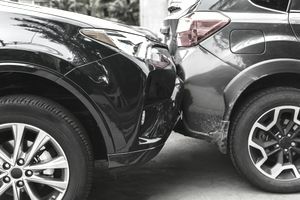 Collision repairs damage when two vehicles in drive or reverse collide with each other. It covers damage to your vehicle when you hit ice and slide into an inanimate object. Collision coverage can get expensive, so to lower costs, most people choose a $500 deductible or higher. For some, the best coverage is the cheapest car insurance policy that makes them able to legally drive on the road. For others, the best coverage is the type that covers the full cost of repairs on your vehicle when you file a claim. The only way to be certain you are fully protected is to purchase both comprehensive coverage and collision coverage. Each coverage has its own job to do. Comprehensive claims are a little more common because more people carry comprehensive coverage on their vehicles. It is the cheaper of the two types of physical damage coverage. Plus, comprehensive coverage addresses the animal- and weather-related damages that are so prevalent when it comes to vehicles. Collision coverage is there for you when you make a mistake. It is very frustrating to cause damage to your own vehicle, but being covered by your insurance policy can help make you feel a little better. When selecting coverage for your vehicle, the biggest thing to consider is the cost of the coverage versus the value of your vehicle and potential costs of repairs. Once you determine you have the ability to cover the damages out of your own pocket, it is time to reduce coverage. What Type of Car Rental Insurance Do You Need? Do I Need Comprehensive Coverage for My Car? When Is the Right Time to Teach Your Kids About Car Insurance?